The company which now owns the abandoned Vermilion Power Station north of Oakwood says it understands the frustration some have about riverbank stabilization work that needs to be done near the plant. Vistra Energy says it is ready, willing, and able to proceed with projects aimed at stabilizing the riverbank and permanently closing surface impoundments. To do so, however, Vistra must receive the approval of state and federal environmental agencies. 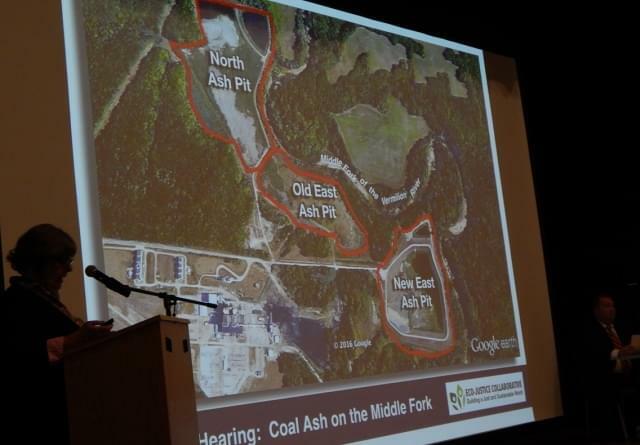 The company’s statement came as Eco-Justice Collaborative hosted a ‘People’s Hearing’ at Danville Area Community College Monday evening (June 11, 2018) regarding concerns about coal ash seeping into the National Scenic Middle Fork River. Andrew Rehn, a Water Resources Engineer with Prairie Rivers Network, says holding the public hearing was important…. Vermilion County Board Chairman Mike Marron agrees that the issue regarding concern over the coal ash pits needs to be resolved…. Rick Cobb of the Illinois Environmental Protection Agency says any closure plan for the coal ash pits must be able to continue ‘’in perpetuation’’ (indefinitely). 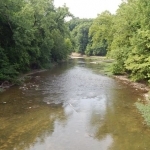 Cobb is Deputy Division Manager of the Division of Public Water Supplies for the Illinois Environmental Protection Agency. A large crowd turned out for the event which was held at the Bremer Conference Center at Danville Area Community College. The meeting gave area residents a chance to voice their concerns about the coal ash.